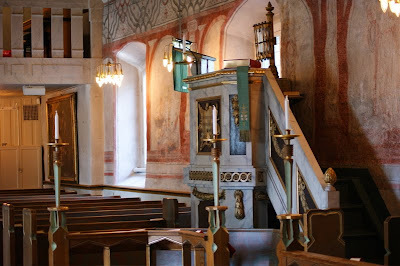 Here's the pulpit in Lidingö Church, seen from a different angle. Hello Per. I browsed the "church" tag. Let me mention some remarkable items to add: Uppenbarelsekyrkan in Saltsjöbaden, S:ta Ragnhild in Södertälje, and the old cemetery in Nacka where the first Nacka church was situated. Thanks a lot, Svenske Floyd. Do keep those ideas and suggestions coming, they are very much appreciated. I can say that I often like churches proportionally to the presence of wood. I like this. Sort of a theme in all Nordic countries I guess.